If you are a native Chicagoan, this post heading should not be any surprise to you. Chicago weather, not matter what the news say (even if it’s Tom Skilling), the weather will not be exactly what you expect it to be. 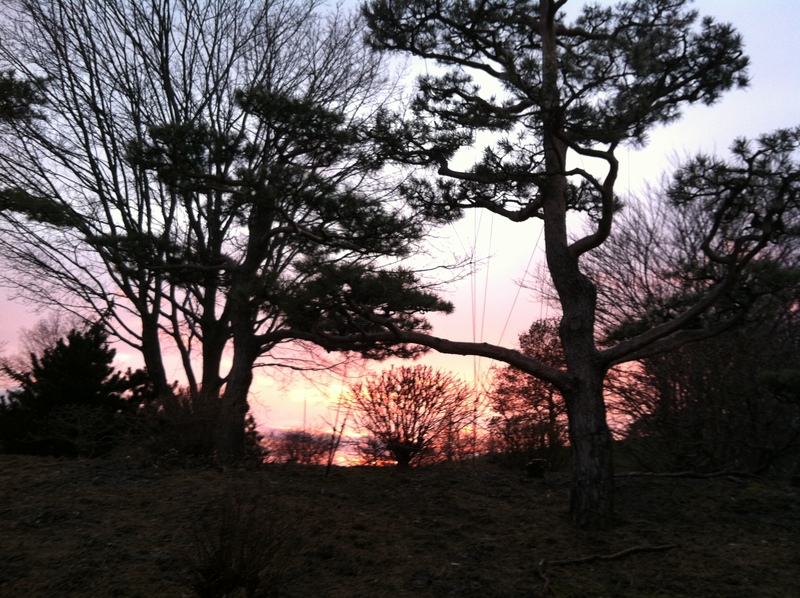 The winter season, especially, has been very funky lately. We haven’t had a white Christmas in years and snow does not fall much until late January and much of February. Luckily, we haven’t had much considerable snowfall yet, or at least not like the northeast states just recently. The mornings can be super cold and freezing, yet in the afternoon and evening, it can be so warm that you’ll find joggers outside in shorts (and no, I’m not being dramatic). 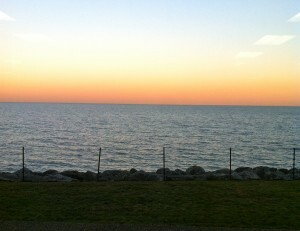 Especially with Lake Michigan located right next to the Loyola Lakeshore Campus, students experience a lot. From lake effect snow to lake effect winds, or even both, things can get crazy- the lake waves are a visual sign. One moment in particular, as I remember it, it rained in the morning, hailed in the afternoon, and toward the evening, it rained. Another day, it was so windy that some students fell over the sidewalk and rolled onto the grass ( I may be slightly dramatic here…). 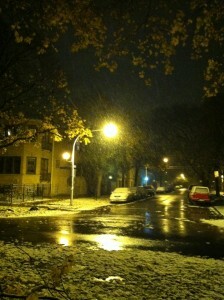 Nevertheless, it was funny to see what Chicago weather can do. One more thing. 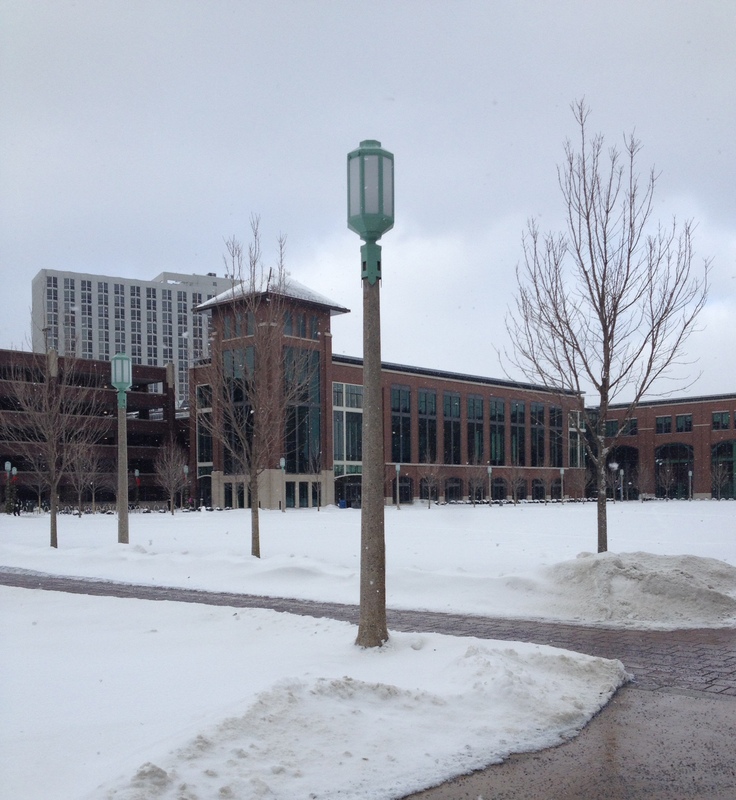 ‘Snow days’ are rare at LUC. So let’s all assume that we all have sled dogs and snowplow machines as we make commute in the “last-judgement/end of the world” snow blizzard (if it happens). On a lighter note, LUC students are more/less prepared for any weather. We are strong! 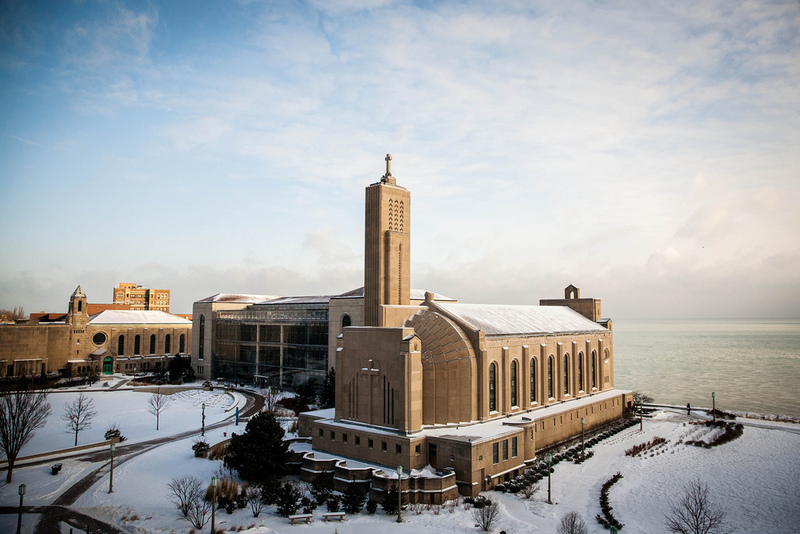 The city and Loyola University are prepared for any crazy weather and will make sure sidewalks are shoveled and free of slippery ice. Not much longer, spring will come and then we’ll relax back outside on the quad playing Frisbee and reading books. Eventually the snow will melt and the vibrant colors from the green grass and flowers will bloom. I cannot wait for this time of the year to come as I am a little exhausted with the things winter currently does to people. With winter, comes slush, traffic jams, slush, overly sized puffy jackets, and more slush; getting up for school during the winter time can be hard without the sun’s appearance yet. Snow can look so beautiful, but the color of white can get tiring as it already is for me. I would love to see the warm, bright sun out more frequently to bring the students outside of their resident halls and hang around outside for a walk for crisp, fresh air. I digress, that is just me daydreaming in Damen near a warm radiator. My first week of second semester went well as I was able to attend and enjoy all the classes I enrolled in. Luckily, I am fortunate to have friends in each class. With that being said, I know I can do better academically and relieve some of the tension I brought upon myself last semester when I did not know anyone in class. There is always room for improvement. I am not waiting for spring for that to happen, rather I start now because it is never too early or too late to be a better person for yourself and for others to see. 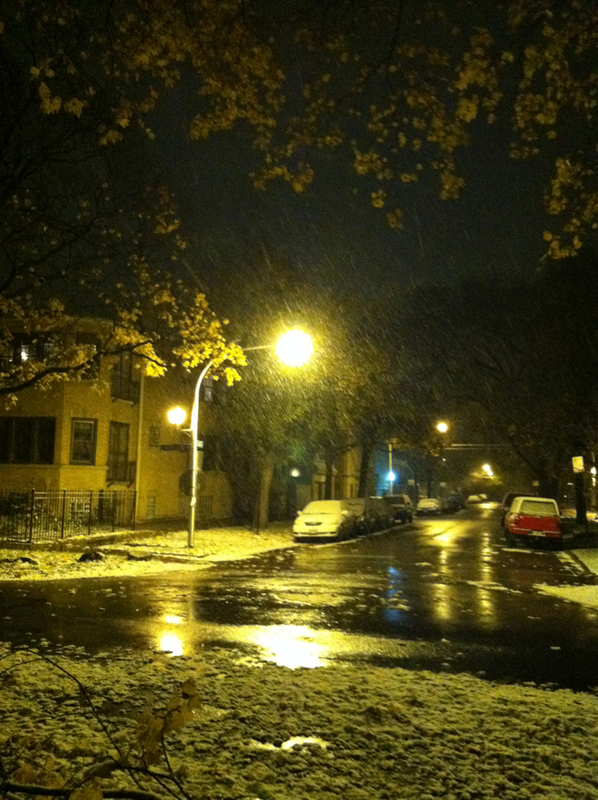 Finally, Chicago has gotten its first snow of the year! For some people, snow is the wonderful white blanket that shimmers on the street and for others, it is the irritating substance that falls out of the sky and must be shoveled off of roads, sidewalks, and cars. Besides snow, the temperature itself is getting colder and colder; by Wednesday or so, we are supposed to hit the single digits or even get below zero. Anyways, as a native born Chicagoan, I have experienced all of Mother Nature’s doings thus far. I have learned a couple of things to get by with this extreme weather. If you have to be somewhere at a given time, leave EARLY (like 30 minutes). Traffic on the streets are terrible when snow, slush, and cold temperatures are involved. Cars move slowly, pedestrians take extra caution walking across the streets, and no driver wants to be near the city truck that dispenses salt onto the street. Dress with layers. Even though this is an obvious piece of advice, it is good to be reminded. If you shovel snow now, things will be good. Clean up the sidewalk and driveway at any possible time! The more you procrastinate on this, the more difficult it is to clean it up later. The snow might freeze overnight! Be nice to others. After shoveling and the feeling of being cold, it is common for people to not be in the best mood (especially in the morning). Even if you are not in the best mood, try not to carry that on towards others. -Stay warm & have a wonderful day! My last final was on Thursday and I was relieved and happy to have finished testing before most of my friends. Nonetheless, I had come back to school the next day to wish my friends good luck on their tests and for the whole day, I was relaxing in a comfy chair enjoying myself watching Netflix. That very weekend for the first time since August, I was able to sleep freely without any worries. I am proud of myself to have accomplished so much in my first semester of college, and I personally think I deserve to relax, be happy, and finally breathe during my break. During my break, I do not plan to travel or do anything extraordinary. I will be at home, just like every year, taking care of my brother and house while my sister goes to school and mom goes to work. We might have a Christmas family party and I will forward to that very much as I will be able to see my other family members I have not seen in quite a while. I have a lot of young cousins in the family, so I am certain that we might take them to see the zoo lights or Navy Pier, or the Christmas market they have downtown at Daley Plaza (all of these options would be the first time these youngsters). With all that being said, I wish each and every one of you an amazing winter season filled with your beloved family and friends. It feels like forever since I’ve last seen a sunrise or a sunset. I’m either in class or somewhere indoors when the sun sets, or it’s cloudy outside, or the skyscrapers of Chicago cover the radiant sky. 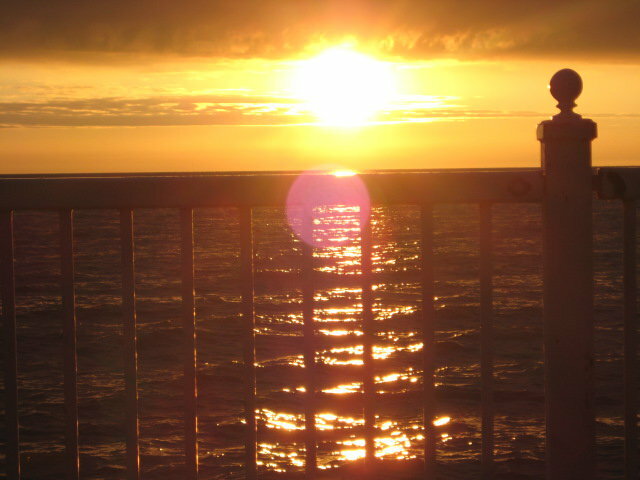 So I decided, for those people who agree with me, to post some photographs, both new and old, of some sunrises and sunsets taken by me in the Chicago area as a reminder that they do still exist. I took this photo back in the day when I was still in high school, when I was waiting for the bus one Winter morning. 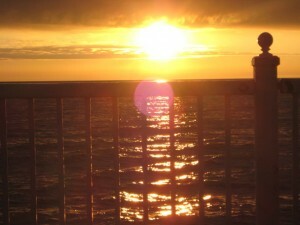 This is one of my favorites, taken in the early morning after my high school graduation at Glencoe Beach, where my whole graduating class was meeting the start of a new beginning for all of us. 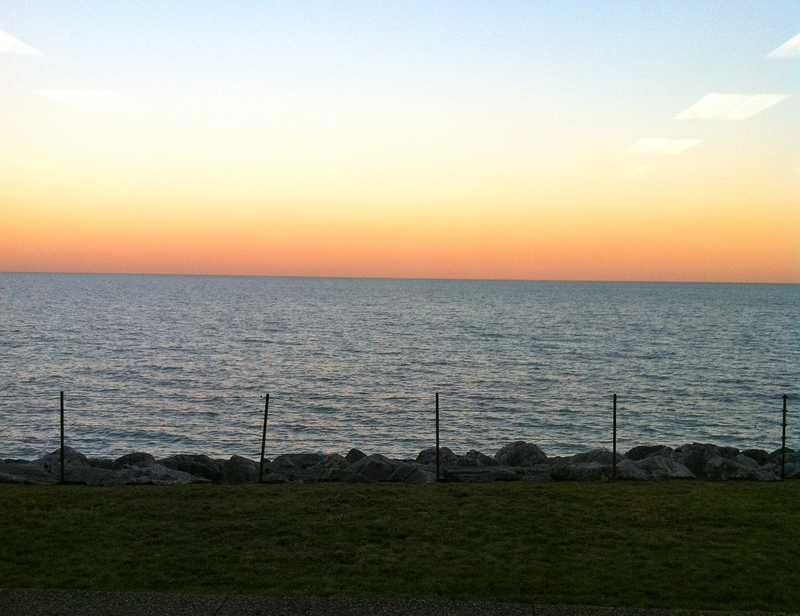 This is a recent sunset photo taken over this past Winter Break from the window of the Undergraduate Admissions Office. 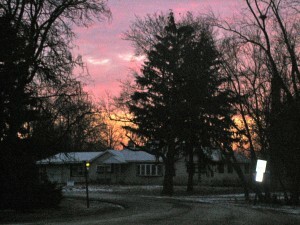 This sunrise photograph was taken in the suburbs of Chicago. This photo was taken when I went for a walk in the Botanical Gardens near my home in the suburbs. Is anyone as excited about this as I am? There could not have been a better surprise to walk outside to after a long day in the library than the east quad full of snow! And not just flurry-do-nothing snow. Real, stick to the ground, make everything beautiful and white, snow!! The snow as I was walking home from the library. I already mentioned the wacky weather of Chicago in a recent post, but sometimes it’s not so much the conditions but rather the reaction to the temps that is a bit outrageous. 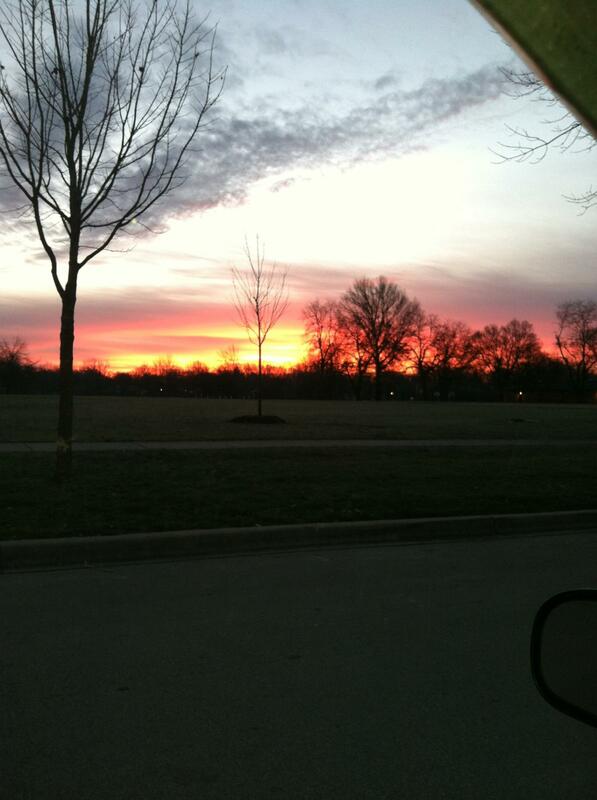 For instance, Tuesday was a gorgeous spring-like day. The sun was shining and it was surprisingly not very cold at all. 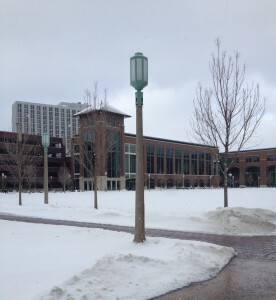 Most Loyola students abandoned their heavy winter coats for a hoodie and some even walked to class in shorts! I said it wasn’t very cold, but that doesn’t mean it was very warm, either. The high was around 50 degrees. The point is, Chicagoans seem to always be biting at the chance to shed the heavy coats and sweaters. Even though the following days were not as warm, I saw people out and about wearing shorts and spring dresses. I even saw a convertible with the top down! I, too, am ready for some spring, but I don’t think it’s time to bust out the shorts and tank tops just yet. 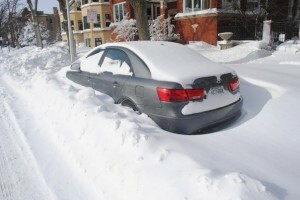 I think we all need to keep in mind last year’s blizzard, which happened in February! What do you think of when you think January 31 in Chicago? I generally picture snow, ice, cold and more snow. Well it’s January 31 and we have zero snow, zero ice and zero cold. In fact, it is 56 degrees! Walking to class today in this weather gave me spring fever and made it hard to realize that we sill have over three months of class left. 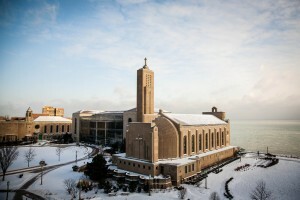 It was only two days from now last year that we had the huge Chicago blizzard that left us with 15 inches of snow, temperatures below freezing and Loyola’s first official snow day in years. Yet here we are today enjoying temperatures in the upper 50’s. I am not even concerned about grabbing my heavy-duty winter coat out of the closet anytime soon because the 10-day forecast does not have the temperature dropping belowing freezing during the day. It’s crazy! Now, coming from Michigan and being a big skier, I normally would be bummed by such a warm, snowless winter. Being in college, however, is a different story. Walking to and from class is much better in the warm weather and not having to bundle up every time I want to get a meal, work out, or go to a friends residence hall is a big plus. For the first time in my life I’m siding with the radio jockeys and weathermen/women who complain about snow. For all of you out there who are wishing we had more cold and more snow, I sympathize with you. A warm winter can be so disappointing and I am confident that after college I will be right there with you. Until then, however, I love and embrace this warm weather. 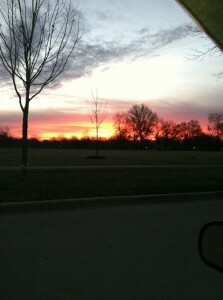 There are many reasons I love Chicago but at the top of the list is winter. This is especially true just before Christmas. Here is a list of all the things I have done over the past month and everything I look forward every year. 1. Ice Skating: Always a fun thing to do, especially, on those days when the sun comes out and you feel like you need to take advantage of the great weather. 2. Zoo Lights: Christmas music combined with tons of lights and a zoo… It’s kinda awesome! 3. Ugly Christmas Sweater Party: Always a classic and there is always an uglier sweater than the one you have on. It’s amazing what the 90s produced in terms of clothing. 4. The First Snow: Better late than never, time to get out the pig skin and play some football in the snow. 5. Christmas Lights: The lights are everywhere and downtown has the parade each year to celebrate turning them on.